Location: Shop B, G/F, 9-11 Cleveland Street, Causeway Bay, Hong Kong; G/F 20-20A Ashley Road, Tsim Sha Tsui, Kowloon, Kong Kong. This restaurant needs no introduction. 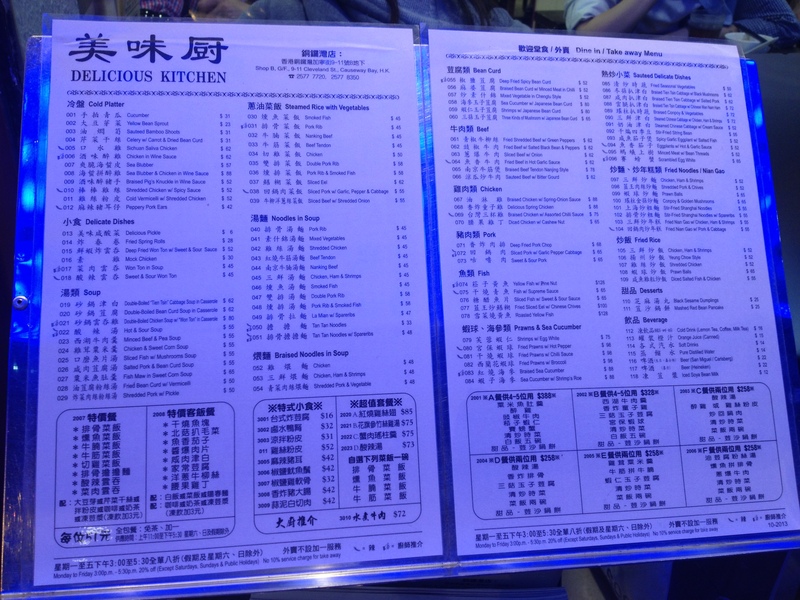 If you regularly travel to Hong Kong, I am pretty sure you know Delicious Kitchen. It is the home to Hong Kong’s most famous Double Pork Rib Rice, a staple to many tourists coming to Hong Kong. A trip to Hong Kong is incomplete without getting the Double Pork Rib Rice. Rated #57 out of over 4000 restaurants in Hong Kong at Trip Advisor, Delicious Kitchen at Causeway Bay is becoming more and more packed everyday. Aside from Double Pork Rib Rice, locals and tourists alike head to this Cha Chaan Teng for their fried wontons, and several dishes that makes Delicious Kitchen extremely popular. Having dined at Delicious Kitchen in what seemed like forever, I already know how the experience in dining here can be ~ everything from incorrect orders to customers who walk out of the restaurant, not paying their restaurant bill. It’s how packed the restaurant is, with their staff usually doing two or three things at a time. The customer service here isn’t exactly superb, but people still come back here for only one thing: The Pork Rib Rice. There is only one dish I want you to order and that is their Double Pork Rib Rice. Yes, they have single pork rib, but I am pretty sure you’ll be able to finish it, and come back for more. Hence get the Double Pork Rib. You’ll find that it’s sweet and tangy in taste, plus the juicy and oily breading will definitely make you say this is the best Pork Rib in Hong Kong. Delicious Kitchen serves their Pork Rib under a bed of fragrant vegetable rice that’s very delicious ~ a feat seriously difficult to imitate even in the Eat Well Delicious Kitchen franchise that didn’t pick up here in Manila. Surprisingly, I love their Fish Maw soup. It was very warm in the stomach, perfect because I was so hungry. Plus points also for its large serving. As a lover of fried noodles, I like the combination this brings to my pork rib rice. I love love love Japanese beancurd. It was very silky and soft. See how delicate it can be? It was hard to pick up using chopsticks! I think Delicious Kitchen has earned itself the title of Hong Kong’s Best Pork Rib. Don’t miss it when in Hong Kong.